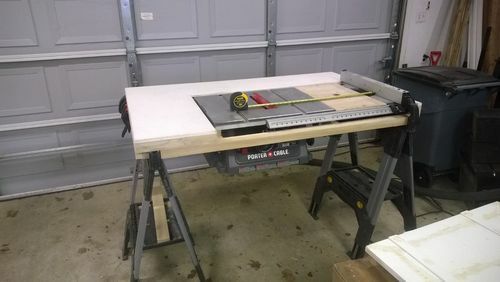 A couple of weeks ago I built a router table that fit into the extendable table on my Porter Cable 220TS table saw. I wasn’t happy with it so I tore it down, except for the fence, and rebuilt it correctly. I used 3/4” melamine. I had to route out a small portion (about 1/4” deep) on the under side for the mounting screws to work and to make sure I could fully raise the bits high enough. I also had to route the sides down about 3/8” to make the top flush with the table saw. This works good though because it keeps the table secured nicely. I am very happy with how it turned out. This is the first time I have used the t-track and Kreg featherboards on any of my projects and I am very satisfied with how they work. My only regret is that I didn’t do this sooner! Great idea! I have that saw but never thought of putting a router insert in the expanding wing. I will definitely try this. I have same saw, I use it as portable jobsite saw. I did similar setup, I did not build fence, rather I attached a piece of poplar to table saw fence. This way I can use Ts fence for both router and Ts. No need to break down fence for rips, just lower router down, and I have 24” rip capacity. I also built a 38”x53” table that saw with router drops into, this sits on a set of adjustable horses, I used leftover poplar for frame, and azek for top, rounded all edges. I now have about 12” outfeed. It is light and easy to breakdown and setup, I will post pictures once I get a minute. 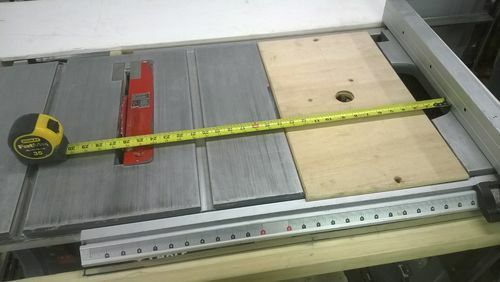 CB- I thought about using the existing table saw fence, but I couldn’t slide it all the way over because the router table sits on the fence rails. How did you get around this? Let me know when you post the pictures. I am interested in seeing it. Hey this is a great idea and would work on my Bosch 4100 but I am wondering if the weight of the router distorts the rails at all… over time? would be interested to hear your thoughts on this. -- If someone tells you you have enough tools and don't need any more, stop talking to them, you don't need that kind of negativity in your life. I don’t know if it will distort the rails, but I am taking precautions like it will. For now I take it out when not use. 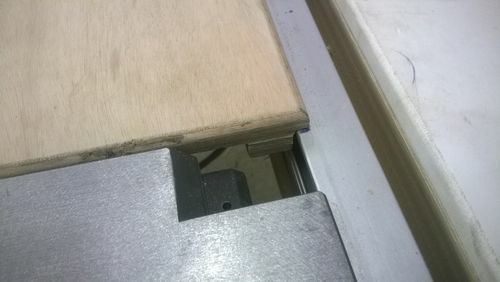 In the future I am going to build a cabinet around the saw which will support the rails. AaronS, I routed out about a 16th off the back of a piece of cabinet grade 1/2” plywood, and pinned a small 1/2” x 1” brace along front and back of insert. My router inserts hangs over rails, just about 5/16” on the front and back, this allows the fence to work all the way to the end. I checked today, I get about 26” rip. I also installed a 2” washer with thumbscrews under the front and back rail to hold it down. The braces run parallel to the rails, so they keep the router insert tight, I eased all the edges, and made it a very snug fit, it works great. your fence is much nicer then what I use, but I use this as jobsite setup, so I really need something easy to breakdown and do mostly dado, and round over cuts, so I really do not need anything crazy. 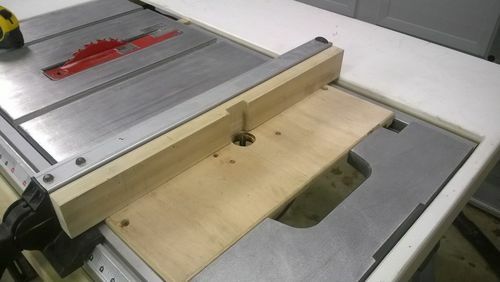 I have another router table setup I also use on larger projects, a Bosch Ra1200, but most of the time, I just use the PC table saw / router table combo. the shop vac hood attached to the top works pretty well too. I braced under the rails with strips of the same 1/2” plywood to support them while they support the router table. I am not all that concerned with this $300 saw, but it does work pretty well. 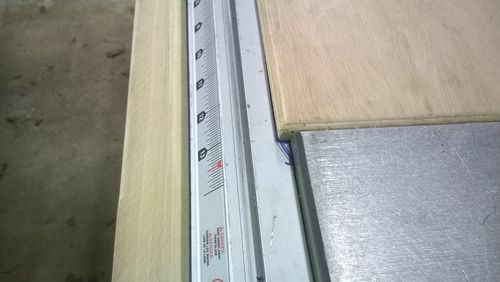 I do quite a bit of interior and exterior trim, and the saw and router combo has served me very well. CB-On my first attempt at this project I used 3/8” plywood and did the same thing you did – made braces underneath that fit against the rails. Since I routed rabbets in each side of this one, I didn’t need the braces. I thought about making the table short enough to still be able to use the fence, but it’s not hard to take the router table out if needed. I like the saw ok. I don’t think you can beat it for the price. This is the 1st table saw I ever purchased and it has served me well. Now that I have been doing woodworking for a few years, I have learned that it does have its limitations. The miter slots aren’t exactly true and the fence system leaves a lot to be desired, but overall it serves me well. aaron, sounds like we had same idea… here are the pics I took in this morning. I have some melamine that I think I will build the insert for the third time… I will stay with this config, it is simple and works well. I used to use the table saw with router insert on the factory rolling stand, but I found the stand to damn flimsy for a jobsite. it wobbled, and just could not hold up to the work. the new setup is a little hard to set up, but give me a nice height, more stable and a bigger table with outfeed. the adjustable horses are pretty handy too, I can set height to match my miter saw stand and my big work table. CB-That looks good. I agree – the rolling base is too flimsy. My next big project will be to build a rolling cabinet for the saw. I definitely suggest using the melamine, I am glad I did.